It wasn't ET, but a UFO sighting in County Down in 1996 had aspects of Close Encounters of the Third Kind. 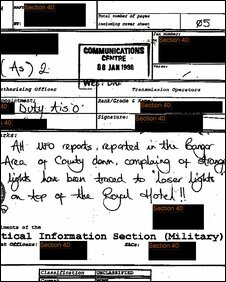 "UFO reports in Bangor, County Down, complaining of strange lights have been traced to laser lights on top of the Royal Hotel!!" it noted. Hotel employee Ricky Gordon remembered the drama back in in 1996. He said that as he recalled the Coastguard provided the answers to the authorities about what the mysterious lights in the sky were. "We had a big laser machine on the roof which sent a big light right out into the sky and there were quite a few reports about it," he said. The machine is still on top of the hotel, but is no longer in use. Mr Gordon said that the light was very powerful so perhaps the confusion it caused among people living outside the town could be understood. "You could have seen it as far away as Carrick," he said. "Everybody was talking about it, but most people knew it was just from the hotel." The details are on the National Archives website, which have been released as part of a three-year project by the MoD and the National Archives to release files related to UFOs. The latest batch of documents, which cover the years 1981 to 1996, have only one Northern Ireland incident. The hotel lights were not the only simple explanation for odd sightings; dozens of reports of a brightly illuminated oval object were reported over London, caused by what was actually a Virgin airship advertising the launch of the Ford Mondeo. One series of sightings stretched from the Republic of Ireland to Wales and the West country in 1993. Two bright lights were observed on 31 March at 0105 GMT and, according to one report, the Irish government despatched a jet to monitor the objects. The objects, thought to have been travelling at about 3,000 mph were too fast for the jets and were believed to have been the re-entry of a Soviet 2nd stage Tsyklon launch vehicle which had put a Cosmos 2238 satellite into orbit.